Thachan,the name of archaeological pertaining master of Carpenter, Architect, Carver, Sculpture by wood and stone. This is the message of Universal community having national perspective in mind, our attempts are to strengthen the national mainstream by bringing about closer understanding among the people of different State and different Languages. With rules deep in the past, presently we take contribution to the nation keeping its steady gaze on the future and it devote to the nation realize about Thachan Dynasty. According to Vishwakarma Puranam (വിശ്വകര്‍മ്മ പുരാണം) all creations are conducted by son's of Lord Vishwakarma had Five son's all are saints and abiogenesis first is Manu Brahma (മനുബ്രഹ്മാവ്‌) is doing Tools and Dies with Iron, second is Maya Brahma (മയ ബ്രഹ്മാവ്‌) allocated carpentry with wood, third is Twashta Brahma (ത്വഷ്ട ബ്രഹ്മാവ്‌) is Goldsmith and fourth is Carver (ശില്പി) doing with stone and Diamond ornaments, another is Vishwajna Brahma (വിശ്വജ്ഞ ബ്രഹ്മാവ്‌) handling handicrafts and home related instruments, the allocation of jobs verdicted by Lord Vishwakarma. Regarding the Holy Text Mahabharatham Saint Vithurar (വിതുരര്‍) called Thachan (തക്ഷന്‍/തച്ചന്‍) about Mayan (Mayan is the second son of Lord Vishwakarma) and Mayan (തക്ഷന്‍) is incumbent of make "Arakkillam" (അരക്കില്ലം) a house which is made by highly inflammable wax only. Thachan (മയന്‍) had only right to installation of idol (deity) in Temple at anciently so they are known as Stapati (സ്ഥപതി ഭണ്ഡാരങ്ങള്‍). :(വിശ്വകര്‍മ്മ പുരാണം). Thachan is the name of archaeological pertaining master of Carpenter, Architect, Carver, Sculpture by wood and stone. Their mythology revealed that Thachan (തച്ചന്‍) is versatile figure to structures, creation and its Science for Carpentry Thachusastram (തച്ചുശാസ്ത്രം) at an antiquity. Thachan is prominent every assembly of (Raja Sadas (രാജസദസ്സ്)) the emperors not ignore Thachan they able to conduct puzzled and sophisticated subjects, they wise and clever because his presence is inevitable for each attempt. 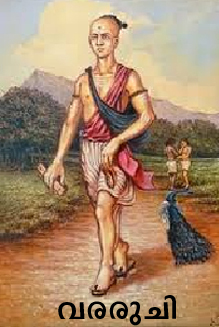 Vararuchi is Brahmin (ബ്രാഹ്മണന്‍) father was wise and saint. According to Folklore and many legends compilation in Kerala India Kottarathil Sankunni written a Text name Eithihyamala which is described about dynasty of Thachan, its contents Vararuchi (Wise Bhrahmin) married a women who belong to Parayiyar caste (Reed Weaver) hailing from the Village of Thrithala they together set out a comprehensive journey after their marriage, the woman became pregnant several times during their honeymoon trip. She delivered twelve children's, each of them are conserve different Caste and grew popular in their lives.Regarding the legend Parayipetta Panthirukulam Tales and Lore were attributed with them as the main Cast. The eldest was Agnihothri a brahmin, whose place is Mezhathur in Thirthala the others are Pakkanar (Basket Weaver) Next is Perumthachan(Master of Carpenter) another is Naranathubranthan (An eccentric who perceived as mad man) Vayillakunnilappan (Who had no mouth) since Raman was raised by parents who belonged to Thachan Caste (Raman Perumthachan) his perspect and achievements are amazing and sublime his performance highly prospective. He read Sacred Texts and imbibed the ancient intellectual tradition. He was attributed many great architecture like Temples, Palaces thus he became chief of architect called Perumthachan (Peru പെരു= versatile Thachan തച്ചന്‍) inheritors and followers of Raman Perumthachan are Thachan Caste, belong to Perumthachan dynasty. Raman Perumthachan had a Son named Kannan (കണ്ണന്‍) excelled in Carpentry and Architecture surpassing than Perumthachan. The respect of Perumthachan's son Kannan spread across in Kerala India which is blinded by his professional jealousy. Perumthachan deliberated to thwart his son's perfection and popularity. Once up on a time coincide both are amendment work on roof, Perumthachan over the roof Kannan just beneath, Perumthachan dropped his Chisel on his own son an aggressive animosity killed him on the spot. Pertaining an another legendary Kannan was certainly a greater architectonics in all craftsmanship. But his father never envied him, he was only proud of his son notwithstanding Perumthachan had a worry about his son. Kannan fell a deep love with a Princess who belongs to Brahmin and daughter of a Queen. Princess seemingly understand Kannan had a Brahmin because he had poonul (പൂണൂല്‍) while working at queens palace they together exchange messages, the Princess actually Perumthachan's own daughter born to queen. Kannan and Princess are not aware about their relationship, Princess fatherhood was known to none other than himself and the queen. Nevertheless the gossip known close circle of Perumthachan's associate and Queen's maids. Perumthachan understand the relationship between them and he decide to terminate son Kannan's Life, during they together undertaking repair work, Perumthachan deliberately take off his Broad Chisel on Kannan was chopped off his head. Perumthachan's act was deliberately or was it an accident still a matter of debating among different communities. Regarding folklore of Perumthachan get an appointment for the Palace to make Construction of a Temple within the Palace. The order placed an impotent middle-aged Brahmin King had a young and beautiful middle aged queen who was a Brahmin too she was lived in the Palace under cultural confinements she was a devotee of the Goddess Durga. The King decided construct a Temple within the Palace entrusted Perumthachan to construct Temple and Goddess Durga. Perumthachan tried to several times to carve the face of Goddess but it has not achieved. This was the first time for him the fact was that the queen used to peep through on her windows at him and he himself was aware of this deed of queen, hereinafter he could not get an idea of how make the face of idol. He could not get a clear face of the queen. One day the queen come to supervise the progress of sculpture she surprised the face was blank. Perumthachan described his intention and agreed to sit with him to take down her face for this sculpture. The queen gestured Perumthachan late night to her private room at the appropriate time, the King during the official visit beyond his jurisdiction the queen signaled him to join togetherness, this experience continue several nights. When the King return from journey to examine his work the idol face was blank, seeks the reason of blank, Thachan says he had no idea how it make, and ask to the King's permission of seen queen's face. The King permitted him to see the queen's face only once, but the meeting was continue regularly. Perumthachan Construct an illusive Pond at Uliyannore in Aluva which is the requirement of Temple committee. Three of the committee are different concept about the pond, one of them want square Pond another want round and the third is need rectangular shape. Perumthachan agreed all of them satisfy their desires, create an sophisticated pond, after completion of pond examine each member all are feel(each of them) Perumthachan fulfill my opinion, the original shape of pond none of the three it was highly irregular and make fool onlookers. According to another mythology Perumthachan and his son Kannan had plenty of relations with other womens and queen's in Palace where they had done jobs their attractable attitude were fascimile of everyone thus tie-up with women's and queen's interbreed many children's, they grew intelligent and heritage of their profession they are the series of Thachan Caste.Dynasty of Thachan's are began thus.